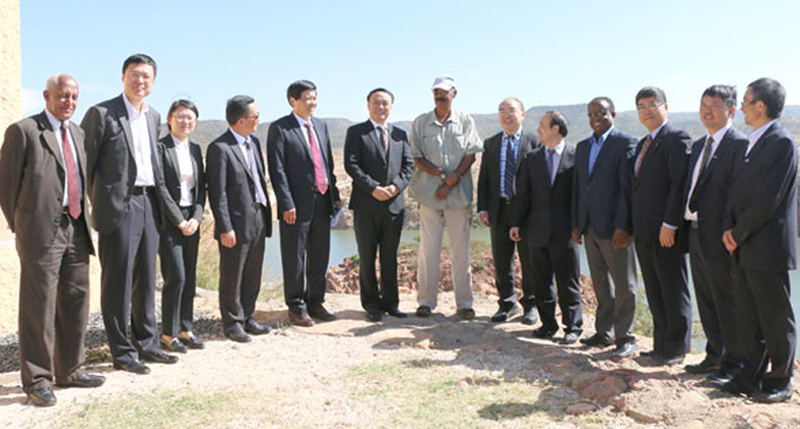 A Chinese delegation led by Mr. Liu Jie, Vice-Governor of Sichuan Province, met President Isaias soon after they sign a deal to acquire 60% of the Asmara Project from Canadian junior Sunridge Gold. President Isaias Afwerki today received a senior delegation of the People’s Republic of China led by Mr. Liu Jie, Vice-Governor of Sichuan Provincial People’s Government. President Isaias referred to the long-standing warm ties that exist between the two countries and underlined the reservoir of good will as well as the conducive climate that exists for Chinese companies to actively participate in major investment ventures in the country. Mr. Liu Jie, for his part, paid tribute to the deep and expanding ties between the People’s Republic of China and Eritrea. The Vice Governor stated that Chinese companies are prepared to invest in physical infrastructure and particularly in mining, the construction of dams and bridges as well as in agricultural projects. In addition, the Chinese delegation met with Mr. Hagos Ghebrehiwet, Head of PFDJ Economic Affairs, Mr. Berhane Habtemariam, the Minister of Finance and Mr. Abraha Asfaha, the Minister of Public Works to assess progress of investments already underway and explore concrete prospects for future engagement. Mr. Liu also met with the Governor of the Central Region, Major General Romodan Awilyay, for discussions on specific areas of cooperation. An agreement for the purchase and transfer of Sunridge Gold Corporation’s (SGC) 60% share of the Asmara Mining Project to the Sichuan Road Bridge Mining (SRBM) was signed during the visit of the Chinese Delegation. The Eritrea’s National Mining Corporation (ENAMCO) owns the remaining 40% equity in the venture.